We all want to be overcomer’s. The question is how. The Kingdom is exciting and is progressing from individuals all the way to nations. It’s easy to see the advance even in the news. Kingdom warfare and casualties are also a reality. Even though Jesus has already won the victory, there are enough delays and defeats to confuse us all! But we see Jesus – Committing ourselves to Jesus’ lordship and putting the Kingdom first, signs us up for both the victories and the battles that precede them. Warfare is often pictured as survival . . . standing firm until it’s over (e.g., Eph 6:10-18, Dan 7:21, 25, Rev 12:17, 13:7). There are seasons when we don’t win. In fact, resurrection is one of the strategies of warfare! When all our best efforts don’t work, God can still redeem us from a failure. All things can still work together for GOOD (Rom 8:28). 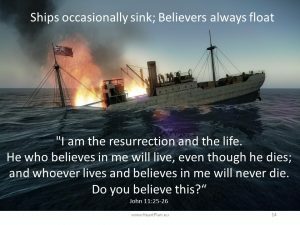 Ships sink but believers float. Hebrews 11 is the honor role of overcomers who died waiting for their inheritance. They still believed even though they didn’t see the promise in their lifetime. Kingdom initiatives often take longer than we live, yet we’re not waiting for heaven to see the next reformation and play our role. Put your Nike’s on – So, it’s a bit risky to define overcoming as success. It’s an attitude of faith that is superimposed over good and bad circumstances that puts us on a persistent trajectory toward our book and our Father’s purposes. We overcome when we can “see Jesus” even if everything goes wrong. Doing exploits to expand the Kingdom or getting martyred for trying . . . both get the same pay! nikao (nik-ah’-o) NT:3528; from NT:3529; to subdue (literally or figuratively): KJV – conquer, overcome, prevail, get the victory. nike (nee’-kay) NT:3529; apparently a primary word; conquest (abstractly), i.e. (figuratively) the means of success: KJV – victory. So back to the context of Hebrews 2 . . . though the kingdom can seem like a mess, it’s the mess that is the means to bring many sons to glory. We become part of God’s family, Jesus calls us brothers, and we are seated with Him for a reason – to rule or lead. We use that leadership, authority and power to fix “messes,” not just passively endure them. What carries us – For starters, we overcome from a foundation of knowing we are His sons (contentment). The wind beneath our wings (initiative) comes from knowing something about our assignment (the word of their testimony from Rev 12:11). That testimony, or story, is our book – the one Jesus wrote in our heart. It’s His testimony about us; that’s the theme of his continual intercession for us. Knowing that we have a book (Ps 139:15-16) and knowing something about the story, is what fills our hearts with the tenacity to overcome. We each carry a calling that is very prophetic and powerful. When that purpose is touched, we come to life and co-labor with what our Father is doing from the heart. Evangelism of the heart – Whether I talk to believers or pre-believers, I try to touch the purpose or dream God wrote in their heart (either formally via the Heart Plan or conversationally as friends). We are all ignited by our book. We are all carried by the wind of the Holy Spirit through great trials and delays to places of thrilling victories. The nations are God’s inheritance. There is some aspect of redeeming nations with your name on it. When you touch it, your heart will come alive and so will your relationship with the Father. He’s already there, waiting to unpack your inheritance.